In today's audio, we hear about how to craft your ideal life vision, and why it's important to do so. It’s difficult to embrace a new vision for your life while being hampered by old wounds that haven’t been tended to. Spend some time in introspection. Are you harboring resentment? Do you need to forgive someone? Are you hanging on to hurt that needs healing? Be honest about those feelings, seek out wise counsel, and start the restoration process so you can move on. If you are like me you think highly of yourself and your importance. However, we are not the center of the universe. Seek out a vision for your life that makes the world better for others. Scottish Olympic runner Eric Liddell famously said, “God made me fast and when I run I feel His pleasure.” We were all made with God-given talents. What passions and talent do you have that will make you feel like Liddell when you use it? The time has come for you to give that gift to the world. Seek out people whose lives you admire. Ask them how they got where they are and why they do what they do. Perhaps even see if they would be willing to meet regularly. Think about an end goal. 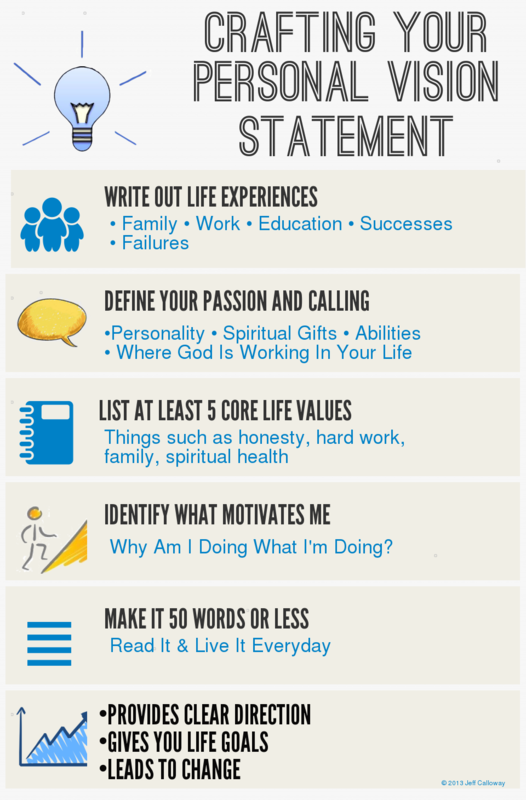 What do you want your life to look like? What type of man do you want to be? What do you want your family to look like? What would you like your career to be? Picture it and see it in vivid detail. Dream big. Don’t allow fear or a lack of confidence shortchange your vision. If your vision doesn’t make you at least a little uncomfortable, then you probably aren’t dreaming big enough. It should be scary but also exciting. Ask the people closest to you if your vision is on point, particularly your family. Make changes based on their feedback and make sure you get buy-in. Think of a one-sentence statement that encapsulates your vision. Write it down and put it somewhere you can see it. Then write down three-to-five action steps that you will focus on the next couple of months that will bring you closer to reaching your vision. When you have accomplished those action steps, come up with new ones. Seek out people that will encourage you and hold you accountable to stay on course. Ask them to press you on it. Be open to the fact that your vision may need to be changed or tweaked as time goes on and circumstances become different. Think of your vision as a living thing.